Alpha Condé is President of Guinea. Condé was born on 4 March 1938 in Boké in western Guinea to Mandinka parents. He won 19.6% of the vote in Guinea's first multiparty presidential election, held on 19 December 1993. Lansana Conté, who had been president since a bloodless 1984 coup d'etat, won that election with 51.7% of the vote. Condé's supporters alleged fraud in this election after the Supreme Court nullified results in the Kankan and Siguiri prefectures, where Condé had received more than 90% of the vote. In the 1998 presidential election, Condé ran again and received 16.6% of the vote, placing third behind Conté (56.1%) and Mamadou Boye Bâ (24.6%). On 16 December, two days after the poll, Condé was arrested and charged with trying to leave the country illegally; he was also charged with attempting to recruit forces to destabilize the government. Controversy during his detention focused on whether he could be represented by foreign as well as domestic lawyers, and whether defense lawyers were being given full access to him in jail. Condé's trial, initially scheduled to begin in September 1999, did not begin until April 2000. Condé, along with forty-seven co-defendants, were charged with hiring mercenaries, planning to assassinate President Conté, and upsetting the state's security. Defense lawyers began by calling for the judge to immediately release their clients, then quit, saying that under the circumstances they could not properly make a defense. The trial was thus delayed several times, during which time Condé refused to speak in court, and his co-defendants denied all of the charges. The trial finally continued in August, and in mid-September Condé was sentenced to jail for five years. However, Condé was released in May 2001 when he was pardoned by President Conté, with the condition that he be prohibited from engaging in political activities. Following his release, he left Guinea for France, returning in July 2005. Upon his return, some reports indicated that he intended to organize the RPG for the municipal elections held in late 2005, but later stated his intention to boycott them. Following Conté's death and the 23 December 2008 military coup, Condé met with Moussa Dadis Camara, the President of the National Council for Democracy and Development (CNDD), on 27 December 2008. After the meeting, Condé said that the members of the CNDD junta were "patriots". Later, however, he opposed the junta and was criticized by Camara. Described as the "eternal opposition leader", Alpha Condé, a member of the Mandingo ethnic group, has a long history within Guinean politics. As a political figure in Guinea, he has ran for presidental office in several elections including Decemeber 1993 and December 1998, both of which he lost with less than 20% of the votes. He lost the elections to Lansana Conté. 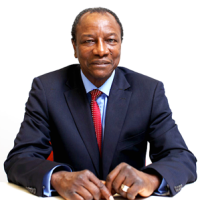 Condé is the current president of the Rally of the Guinean People. Condé is a frontrunner in the 2010 Guinea presidental elections. President Alpha Conde has been sworn-in in Conakry in the presence of several African leaders, bringing the curtain down on decades years of military rule in the west African nation.